One of the most popular tourist draws to Armenia, churches can be found all through the mountainous region. Dating back hundreds, even a thousand years, some churches are run down and decrepit, others have been rebuilt for posterity. A person could easily revolve their entire trip to Armenia and not be disappointed. However if you are not one of those people, don’t give up reading just yet. 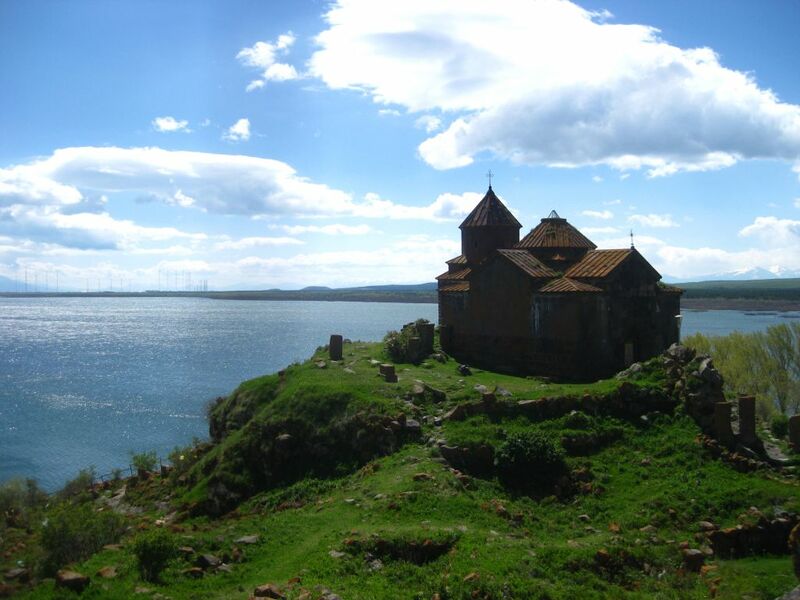 There’s an easy trip to the shores of lovely Lake Sevan that gives you just a taste without being overwhelming. I’ve recommended this to every person who visits the country because it hits three quality sites and can be done in a few hours. So far they haven’t complained. At least to my face. Before touring the sites, it’s pretty important to get there. You have a few possible options available. The first would be to hire a taxi from Yerevan for the day. In theory you negotiate a price upfront after telling the driver what you want to do. In reality if you don’t speak Armenian or Russian the odds of this happening without a huge markup are pretty low. The second option is easier, contact a tour company and work with them. One of the best in the country is Envoy Hostel. The extremely helpful staff run a wonderful hostel in Yerevan for your accommodation and they can set you up with a packaged tour or even one you create yourself. With the hostel being very popular with Yerevan visitors, finding a few others to go with should be easy. And finally if you’re feeling a bit more adventurous (read: cheap) you can take a mixture of public transportation and hitchhiking. Take a morning marshutni to Sevan from Yerevan, hitch down to Gavar, then marshutni or hitch back into Yerevan. Now you’ve covered a decent tourist area, maybe had a transcendental experience like I did, what’s next? Time for a superlative. 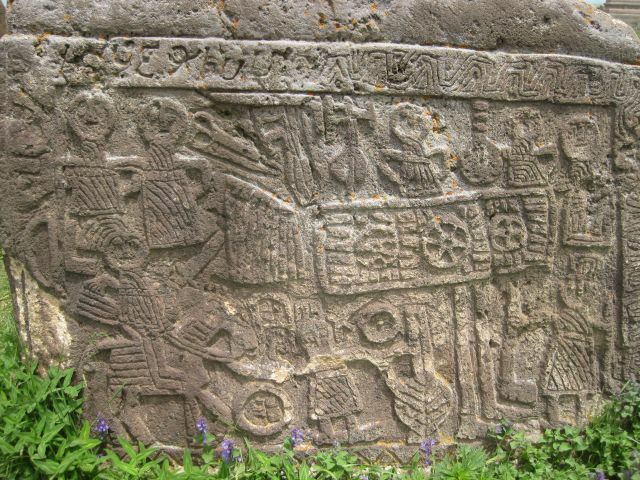 Noratus is the largest collection of Armenia’s famed khatchkars in the world. Previously that title was held Julfa in Nakhchivan until the khatckars there were bulldozed by Azerbaijani authorities. So now Noratus is the place to see the evolution of the stone cross. Evolution is not a stretch when it comes to what you’ll find through the field of khatchkars. There are extraordinarily old stones that have been worn smooth with nothing more than a cross etched on to them using a harder stone. Some are covered in lichen and moss. Others are beautiful examples of medieval Armenian art. Still others tell stories. There are a lot of them. This is the sad story of two young lovers. There once was a young man in the village who was a tailor (represented by the scissors near his head) and caught the attention of the most beautiful girl in the area. When the two decided to wed there was great rejoicing because she was so lovely and he was a well brought up and responsible young man. 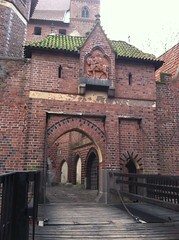 Although the two families were poor they were able to provide enough for a large wedding party (the food and wine jugs) and invited the whole town. The young couple were standing in front of the priest staring lovingly into each other’s eyes when a force of marauding bandits (man on horse) swept down from the hills and began to slaughter the populace. The couple were violently butchered along with many of the other people, but somehow half of the population was able to survive. The groom’s younger brother vowed revenge, and as he marched to the blacksmith to turn his plowshares to swords, his mother begged him to reconsider. She could not bear the idea of losing her only remaining child. After the rage subsided, the brother understood the wisdom of his mother and apprenticed himself to the town’s stone cutter. After three years of apprenticeship he carved out this scene to remember his brother and would-be sister in law and placed it over the place where the two were killed. Most recently in order to help Armenia preserve its cultural heritage as well as promote tourism, USAID sponsored a project to install sign posts and make information available to Noratus visitors. Visit to show USAID and governments that cultural heritage is worth saving. Preservation can be a viable source of income if we as travelers do our part. This entry was posted in Armenia and tagged history, hitchhiking, religion, tour on October 22, 2012 by patwelz. As a Peace Corps Volunteer I was lucky enough to spend two years living and working in the small Caucasus state of Armenia. I’m not going to extol the glories and the utter hardships of Peace Corps, that can be a topic for another piece (PC is not all ‘fortune and glory’ by a long shot). No today I’m going to talk about what makes Armenia great and why it ought to be a place you visit. As a tiny landlocked nation in the Caucasus Mountains Armenia is off the radar of most tourists. There isn’t much of an infrastructure for travelers outside of the capital, but that just adds to the charm. Seventy years of Soviet rule then one of the bloodiest post-Soviet clashes didn’t do it any favors either. But through all this Armenia has so much to offer to the adventuresome traveler. It’s a land of beautiful mountains, rugged terrain through the entire eastern part of the nation. Roads wind through the passes and peaks like a schizophrenic river. Or a snake, but that’s pretty cliched. As the first country to adopt Christianity back in the third century, the landscape is dotted with ancient churches. One of the most wonderful things about the churches is that they were often used as fortresses as well and as such were built on tops of mountains. So it’s an adventure just to get to them. Even in this day and age there are many churches five, six, seven hundred years old that you need to hike a bit to get up to. If there’s one downside to Armenia it’s not very handicap accessible just yet. However all this pales in comparison to the Armenian people. I’ve had the fortune to travel a decent amount and while I’ve been treated pretty well wherever I was, Armenians take hospitality to a whole new level. It is absurd how many times I was invited by random people to their house for coffee or vodka. It got to the point where if I knew about a couple of Armenians opening a bottle of vodka, I would get personally offended they didn’t invite me to join. I know that my Armenian language skills played a big part in this, they loved seeing an American able to hold a conversation; but all my foreign friends in the country who didn’t speak Armenian and the travelers I met always raved how nice they were treated. I can tell you Armenians are welcoming people until I turn blue in the face, but I think it’ll be more interesting for both of us if I recall a story that just proves this point. One day I visited a friend of mine in a nearby town and I was hitchhiking back to my village (sorry PC Armenia staff, but Goal Three). A man in his mid-fifties named Armen stopped after he saw me waving my finger; a bit like you’re hailing a cab with your index finger horizontal and wagging it downwards. I used to use the old thumb deal which worked for me until I was told by an Armenian that I should do it the other way since that’s how locals hitch rides. So I hop into the ubiquitous Soviet Era white Lada and we’re on our way. We exchanged a few pleasantries and he was a little surprised that I spoke Armenian. Less surprised than I would be if he spoke English. We went through the standard rundown every Armenian has ever asked me during a first meeting. ‘What’s your name? How old are you? Are you married? Where are you from? Why are you here?’ Without fail those five questions will get asked and answered in the first five minutes of conversation when meeting an Armenian. I don’t recall a single time I met someone and was not quizzed on my relationship status. After that we chatted about just normal stuff, weather and other small talk. We’re approaching a town called Noraduz, famous for being the biggest collection of Armenian khatchkars in the world. I had already visited the town before to see the cemetery, something I’ll write about later, and told Armen about my trip there and how I enjoyed it. He decided at that moment that I had to have coffee with him. Armenians love their coffee and inviting someone over for coffee is just what you do. It’s a super strong and black blend served in tiny little cups that are a bit bitter than shot glasses. Like an espresso maybe? I don’t drink a lot of coffee and I just wanted to get home so I turned him down. He was having none of that. Armen telling me how great his wife’s coffee was and planned on making me enjoy his hospitality come hell or high water. Armen brings out a bottle of vodka and a pair of shot glasses. His wife was flitting in and out of room asking about me every few minutes, interrupting her husband talk about the Noraduz cemetery and how much of a shame it was that the Azerbaijani authorities bulldozed a large set of khatchkars in Nakhichevan. We keep on doing shots and I’m feeling a bit loose and enjoying the company. Our conversation takes a whole bunch of twists and turns, covering everything from Obama’s refusal to recognize the Armenian Genocide as a genocide to why I’m not married just yet and how I should find a nice Armenian girl and settle down there. And then all of the sudden the wife comes through the door with a huge platter of food. While her husband and I were chatting and drinking she had prepared this enormous meal for us. I would like to say I have no idea why, but I know exactly why. Armenians love visitors. It’s probably the same in many cultures of the region, but I haven’t been able to travel there much yet. Armenians do whatever they can to make a guest happy. It’s something in their national psyche. If a guest has a bad time at your house it means you’re a bad host and by extension a bad person. So this woman who I’ve never seen before baked a whole chicken, fresh bread, made a nice large vegetable and cheese platter because her husband brought home some random American to drink with. And to tell you the truth, it was awesome. I was a bit drunk and really could use some food, especially since I still had a bit of traveling to do. So now the wife finally joins us to eat, she pulled out a bottle of wine and poured herself a shot glass of it to sip on. Rural Armenia doesn’t get many visitors so I assume the wine was to celebrate that fact. No pressure on me right? I might be the only American they’ll ever meet. We eat and drink and at least I had a really good time. It looked like they did too. I hope so. Dinner is over and the vodka is finished so I thank them for their hospitality and tell them I need to leave. Armen however is not done killing me with kindness. Instead of letting me walk the ten minutes to the main road (the exercise would have been nice after the alcohol) he drives me in his car and helps me flag down another ride. He absolutely refuses to leave, even after I told him three or four times I would be fine, until I get into another car. A pair of Armenian guys in their thirties stop for me, Armen starts talking to the driver just to make sure they knew exactly what I was doing and where I was going. Nothing I couldn’t handle, but it was nice of him nonetheless. And then we took off, I chatted with two guys some and got home. This is one of my favorite memories of the two years I spent in Armenia But it’s not unique. I have dozens of other examples of times I was hiking through the mountains and came across an Armenian family who invited me in for lunch. Or when I took some friends to see a 15th century church and we were absorbed into a large group of people paying their respects to dead relatives by visiting each grave while drinking and eating (how I want to be remembered). It was so common I took it for granted. Not being there any more makes me realize how much I didn’t appreciate their generosity. Too many times I would think, ‘I just don’t want to speak Armenian right now.’ You never know what you have until it’s gone, that’s what everyone says. I’m happy I got to experience Armenian hospitality and look forward to the day when I can return once again. This time I’ll appreciate it to the fullest. This entry was posted in Armenia and tagged food, hitchhiking, people on October 15, 2012 by patwelz.